Little Bee is pretty hard-core; it's not exactly the heartwarming story of "rich-white-woman-welcomes-poor-black-girl-into-household-and-both-live-happily-ever-after", a theme which seems to be prevalent throughout literature these days. Little Bee is more about the journey of two people overcoming extremely traumatic events in completely different ways, especially when forgetting about it fails to work because a painful reminder -- or person -- shows up on your doorstep. 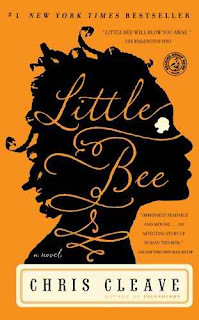 My favorite aspect of Little Bee is not exactly the revealing of the horrendous "event" at the beach in Nigeria, or how each character copes with their grief, but the voice of Little Bee herself. The novel is an exceptional cultural insight into the life of a typical Nigerian young woman, and Little Bee's comparisons of English life to Nigerian life as well as her persistence on trying to understand the English language is nothing less than poetic in the most sad, yet endearing way. The novel is so brutally honest that you can't help but appreciate your own life's everyday comforts. It kinda makes me want to go out and adopt my own Nigerian teenager today. Just kidding...but not really. What did you think about Little Bee ? Did you learn anything from this novel? Chris Cleave has also written Incendiary (2005).